Printed Ribbon is made with our custom designed machinery. Curry Ribbons prints with metallic and coloured foils on our single sided sash and double sided, woven edge ribbons in a wide range of widths and colours. Printed ribbon looks great and has many uses in packaging and promotion of corporate image. Since printed ribbon became fashionable about 20 years ago, we have produced in-house over 4,000 different ribbons. 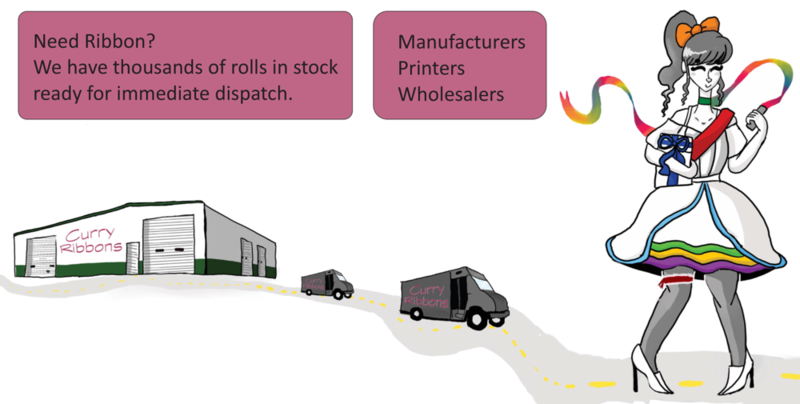 Established in 1947, Curry Ribbons is a manufacturer, importer and stockist of textile ribbons suited to a wide range of uses and applications. Since we manufacture and stock ribbons, our competitive advantage is fast turnaround. Formerly known as J T Curry & Co Pty Ltd (and now trading as Curry Ribbons), we were located in Petersham, Sydney. In 2013 we moved to Katoomba in the Blue Mountains, 100km west of Sydney. Curry Ribbons stocks a wide range of woven edge ribbons suited to an endless variety of uses. We stock ribbon from many countries, creating a wide choice of quality and price.